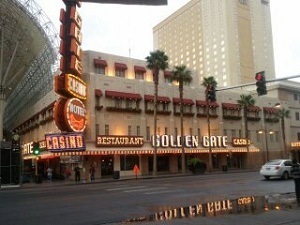 Golden Gate Casino is a must see Hotel/Casino in Downtown Las Vegas. Built in 1906, its all original except some furnishings. You will see the original diner in the back selling delicious sandwiches and Shrimp cocktail. Check out the original check in desk as well as the elevator. 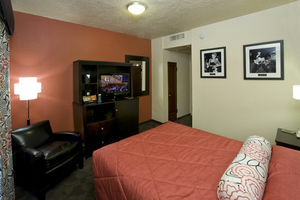 The rooms are the smallest in all of Las Vegas but incredibly quiet. Located in a very busy section of the Fremont Street experience You would not expect a quiet room but It was the most quiet I stayed in on my last Vegas trip. Sports book: Kiosk only. I do not recommend betting without a live person. Some may be comfortable with it but I don’t like it. And some newer games: Texas Hold’em. High Limit Room: no, this whole casino could fit in a high limit room on the strip. Unique to This Casino: 1906 casino, it’s a must see just for that fact alone. 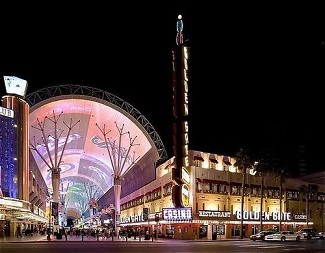 This is a one of a kind Casino, You won't find another like it Downtown or anywhere else in Vegas. And the Hotel is even more unique than the Casino. Smoke Ventilation: Okay to good depending on the number of people. Cocktail Service: Very good, its small so the server will not be far away when you are ready for another. Restrooms: Very modern, classy and clean. Overall Atmosphere: This is a must see Casino. They have modern large screen Lcd tv’s around the table gambling area and the dealers dancing to modern music. Get a 1906 playing card and get a 99 cent shrimp cocktail (1.99 w/o card). They no longer offer the 99 cent shrimp cocktail but at 1.99 its still worth a visit to get it. Believe it or not its one of the best you will have. I cannot get over the age of this place and how modern they have made it. The diner where you get the shrimp cocktail is almost identical to when it was built, check out the photos on the walls. The dancing dealers are partying like its 1906. Even though this Hotel is dated back to 1906, it opened as Hotel Nevada, it only became the Golden Gate in 1955. 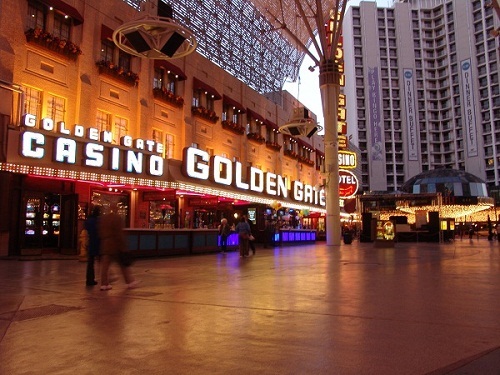 After it was Hotel Nevada it was actually named Sal Sagev, which is Las Vegas spelled backwards.